Yesterday I spent a lot of time installing shelving units to my shed, during which I dropped my best screwdriver into an inaccessible position. I then set to to mow the front grass area, during which Sparky managed to sprain his front right ankle. One trip to the vet, a pain killer injection, a dose of pills for the next week, and a fifty quid bill later, he is jumping about like a young puppy, while I am supposed to keep him on bed rest. 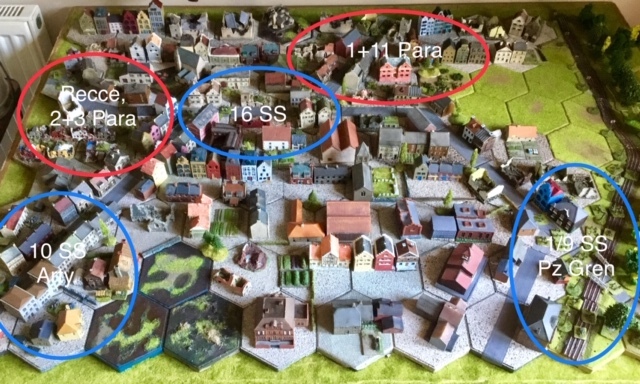 And so back to the wargaming: I started a confused solo tabletop urban battle this morning between elements of 1st and 4th Parachute Brigades of the British 1st Airborne Division and elements of 2nd SS Panzer Division and local forces in the Arnhem area. The result, after 30 minutes game time and a morning’s gaming and documentation, hangs in the balance. Next Next post: Of Agriculture, organisation and old times.